Up next in our national chicken month tribute to chicken blog series we have this recipe for true southern fried chicken and homemade gravy – absolutely irresistible. For Passanante’s Home Food Service customers this recipe couldn’t be easier – just browse our full product list and in a snap you’ll have plenty of succulent chicken cuts delivered to your door. For the most rave of reviews serve your fried chicken and gravy alongside some mashed potatoes, green beans and warm rolls. Empty about 1/2 of the can of Crisco into large skillet and turn on heat. Toss flour, salt and pepper in the paper bag. Put 3 or 4 pieces of chicken in the bag at a time and shake very well until coated in flour mixture. Test the heat of the oil by flicking a small amount of flour into it. It should sizzle. Remove chicken from the paper bag and place pieces in hot Crisco. The oil should go up a little over halfway on each piece of chicken. The secret is to not turn the chicken very often – let it brown on one side before turning it to the other. Be careful not to burn it, it cooks quickly when it first hits the oil. After you fried your chicken pour most of the grease back into the Crisco can to the thrown out. Leave about 1/4 cup of the grease in the skillet along with crispy parts that may be left. Add about 1/2 cups of flour to the grease and make into a paste. Add salt. Turn the heat to medium-high and add milk quickly – stirring continuously. Add as much milk as you need to prepare enough gravy. It will start to thicken and will thicken even more when you take it off the heat. 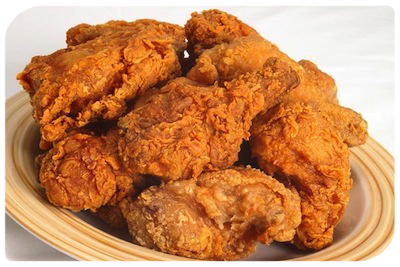 This entry was posted in Poultry, Recipes and tagged Food Delivery Service, Fried Chicken Recipe, Passanante's Home Food Service by Passanante's Home Food Service. Bookmark the permalink.